The Veloster boasts a fun, sporty exterior that'll turn heads. The interior may seem somewhat spartan by comparison, but the console is well-designed and accessible. The Veloster has an interesting hybrid three-door design, which makes backseat more accessible than a two-door but doesn't offer the same access as a standard four-door sedan. Coupes are designed to be small, so tall passengers might find a lack of head room in the Veloster, but leg room is generous in both front and back. The Mazda 3 comes in both four-door sedan and five-door hatch, giving it more accessibility to the backseat area than the Veloster. The Mazda also has a more upscale cabin than the Veloster, with equally comfortable seating up front. However, backseat passengers will find the ride a bit cramped. Though any hatch will have more cargo room than a standard sedan, Mazda 3 can't compete as a sedan or as a hatchback with the Veloster's space for both people and their stuff. In terms of technology, the Hyundai Veloster does not disappoint. The standard features look more like a list of options that you might find on a competitor. Every Veloster comes standard with a 7-inch touch screen, rearview camera, satellite radio, HD Radio, six-speaker sound system, USB port, Apple CarPlay, Android Auto, Bluetooth, voice recognition, and keyless entry. You can also add active safety and convenience features, like push-button start and proximity key, an upgraded audio system with eight-speakers and subwoofer, navigation, and the Blue Link system that connects your smartphone, Android Wear device, or Apple Watch to your vehicle. The Mazda3 competes in the tech area as well, with the MazdaConnect infotainment system standard on all models, along with a 7-inch display that responds to voice recognition. A six-speaker audio system, complete with multiple streaming radio integration options, and Bluetooth round out the standard features. The Mazda doesn't offer Apple CarPlay or Android Auto, however. The 2017 Hyundai Veloster gets 27 city/ 34 highway miles per gallon. If you want an engine to match the Veloster's sporty exterior, we recommend upgrading to the turbocharged option. Performing slightly better in terms of fuel economy, the Mazda 3 gets 28/37 miles per gallon. Critics praise its sporty handling and accurate steering. Safety is probably even more important in small vehicles like coupes, because they typically haven't performed as well as larger vehicles. 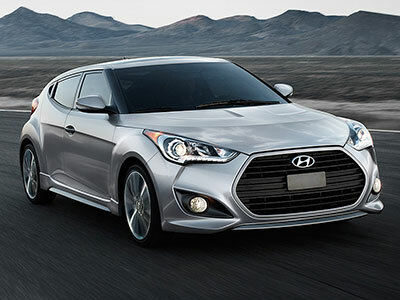 However, the Veloster received a perfect five-star safety rating in government crash testing. Standard safety features include a rearview camera and brake assist, while features like rear parking sensors are optional. 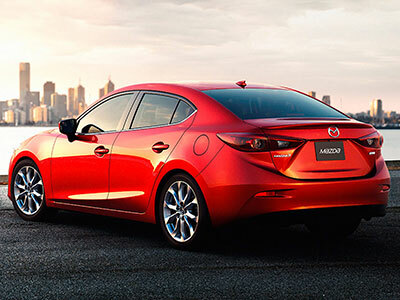 The Mazda 3 also earned a five-star rating, but with a caution. You won't find much in the way of active safety features on the base model, but if these options are important to you, you can add features like blind spot monitoring, adaptive cruise control, rear parking sensors, lane departure warning, rear cross traffic alert, forward collision warning, adaptive headlights, traffic sign recognition, and the Smart City Brake Support system. Competition is fierce in the sporty coupe class, but the 2017 Hyundai Veloster wins this round. This fierce little car packs a punch without hitting your wallet. Test drive the turbocharged option today and see how fun the Veloster can be!